The latest version of the Android operating system, Android Lollipop 5.0, includes a new feature called Screen Pinning. When enabled, this feature lets you lock your phone with one app screen. Anyone trying to access your phone will only be restricted to just that one app. Screen Pinning is also handy when you play games on your smartphone as it prevents your game from minimizing when you accidentally hit the Home button (that happens to me all the time!). Its also perfect when you want to hand over your smartphone for a brief time to your kids. 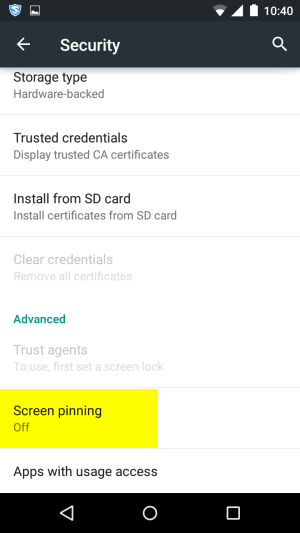 Screen Pinning is not enabled by default in Android Lollipop. To activate Screen Pinning. 1. Open the Settings app on your Android. 2. Scroll down to the Personal section and tap on Security. 3. 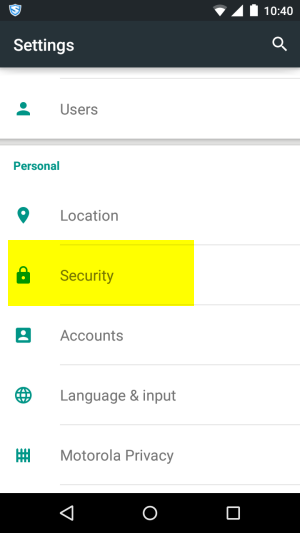 Scroll down to the bottom of the Security page and tap on Screen pinning. 4. On the Screen pinning page, slide the switch to the On position. You will also be able to see the instructions on how to pin a screen on the page. Now that screen pinning is turned on, you can pin any app to the screen and it will remain there until you unpin it. 5. Go to the Apps screen and open the app you want to pin. 6. Now tap the Overview button the screen. This is the Square button on the bottom of your screen (to the right of the Home button). 7. The app will now be displayed in a stacked view along with other apps you accessed earlier. Drag the title bar of the app you want to pin until it is displayed in the middle of the screen. 8. At the bottom-right corner of the app window, you will notice a blue pin button. Tap on it. 9. You will see a pop up asking you to confirm the action. Tap Start to complete the pin up. The app is now pinned to the screen. Anyone who now takes the device will only be able to navigate within the app, but cannot access any other screen. So if you were to pin a web browser, the user will be able to browse the internet, but will not have access to other areas of your smartphone. To exit the pinned app screen, you must touch and hold the back button and the Overview button simultaneously. Hold it for a few seconds until the screen switches back to the stacked view. If you have just upgraded to Android Lollipop, make sure to give Screen Pinning a try.